Plain steamed crab meat is one of the healthiest seafoods you can eat. For a minimal amount of calories, you get lots of protein, the nutrition in crab consists of a multitude of minerals and several B vitamins. 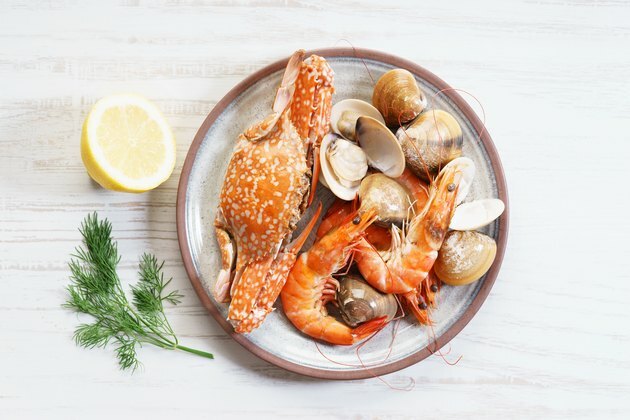 You may want to select certain types of crab or keep your serving size small if you are at risk of developing heart disease, though. Some types of crab have more cholesterol or sodium than others. Yes, crab meat is healthy! It's full of protein, as well as some essential vitamins and minerals. Just make sure you watch your portion sizes and aren't drowning it in butter or other high-fat or high-sodium sauces. Raw crab meat is incredibly low in calories, and almost all of the calories come from protein. Blue crab meat offers just 74 calories from a 3-ounce cooked portion, according to USDA National Nutrient Database. If you prefer Alaska king crab, the same amount has around 71 calories, while a 3-ounce portion of Dungeness crab contains nearly 73 calories. Roughly 85 percent of those calories are from protein. The final percentage of calories are from fat and a small amount from the carbs in crab. Avoid all that butter or cream sauce to keep your calories and fat to a minimum. Just 1 tablespoon of melted butter adds another 100 calories, almost all of which is from fat, particularly saturated fat, says USDA National Nutrient Database. Some consumers may worry about crab meat's cholesterol content. You should have a maximum of 300 milligrams of cholesterol each day or 200 milligrams at the most if your blood cholesterol is already high, states 2015–2020 Dietary Guidelines for Americans. A three-ounce serving of steamed blue crab has over 66 milligrams of cholesterol; the the cholesterol in Dungeness crab is around 56 milligrams. You'll get just 36 milligrams of cholesterol from a 3-ounce cooked portion of Alaska king crab. While too much cholesterol in your diet can slightly raise your low-density lipoprotein, dietary cholesterol alone doesn't always have that effect. Usually your harmful LDL cholesterol goes up when you have a lot of saturated fat in your diet, in addition to excessive cholesterol. Less than 10 percent of your calories, or 7 percent for optimal heart health, should come from saturated fat, as reported in 2015–2020 Dietary Guidelines for Americans. Based on 2,000 calories daily, that's a maximum of either 22 grams or 15 grams. So while raw crab meat is slightly high as far as cholesterol content, it doesn't have much saturated fat. Three ounces of most varieties of steamed crab offer less than 0.2 gram of saturated fat. Because crabs come from the salty sea, they do have sodium. If your blood pressure is high, you might want to limit your intake of Alaska king crab. It has over 711 milligrams of sodium in 3 ounces. If you shake on a few dashes of salt, around 1/8 teaspoon, you'll pack on another 300 milligrams of sodium. That's over half of the 2,300 milligrams you can have if you're healthy; if you have hypertension, you need to limit yourself to 1,500 milligrams daily, suggests the American Heart Association. In this case, salting a portion of Alaska king crab uses up over 80 percent of your sodium allowance. Consider opting for blue or Dungeness crab meat, which each have under 251 milligrams of sodium. Skip the extra salt and season it with fresh, cracked pepper or chopped herbs instead.